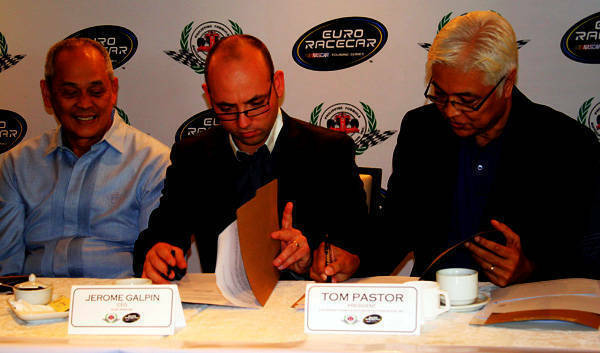 The deal is sealed: The Philippine Formula Autosports Foundation (PFAFI) and the Euro Racecar series of the National Association for Stock Car Auto Racing (NASCAR) have inked a partnership to stage a Euro Racecar NASCAR race in the country--a first in Asia--in November 2013. "We're very excited to bring such a huge sporting franchise like a full-fledged Euro Racecar NASCAR race to the Philippines," said Euro Racecar NASCAR CEO Jerome Galpin, who flew to Manila last Tuesday for the signing held at the Manila Golf Club. Tom Pastor, PFAFI president, is equally thrilled to have the race staged in the country. "We can't wait to get those engines rumbling as we race for that checkered flag in November," said Pastor. "It's our chance to bring Philippine motorsports back onto the world map of car racing." Euro Racecar NASCAR superstars will show off their skills at the first Asian Euro Racecar NASCAR race, which will take place at Clark International Speedway in Pampanga. In addition to this brewing excitement for next year, Filipino race driver Enzo Pastor has opened new opportunities to any driver who wants to be part of the race. The slots for Pastor's partner and two backup drivers are vacant for this Euro Racecar NASCAR race. Enzo is Tom Pastor's son. "This is a historic event. We hope everybody will watch this," said Willie Dandan, PFAFI marketing head. "It's time for the Filipinos to shine." The Euro Racecar series is basically a NASCAR-style, lower-level race held at European circuits. Its inaugural season was held in 2009. In 2010, the FIA gave the series its stamp of approval to make it a legitimate international race series. The champion of the series gets to compete in NASCAR's annual Toyota All-Star Showdown, together with top drivers from NASCAR's other lower-level series.